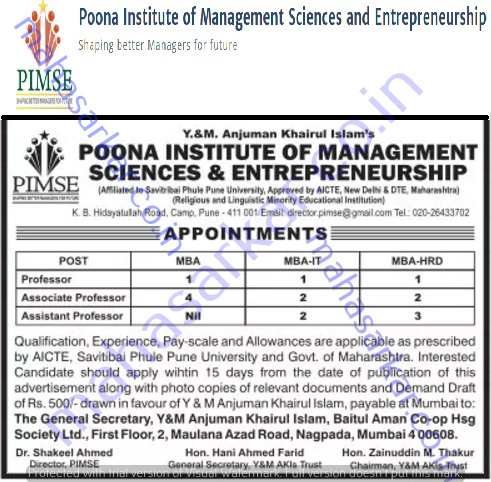 PIMSE (Poona Institute of Management Sciences and Entrepreneurship), Mumbai Published Job Notification for 16 Professor – Associate Professor & More Posts. Candidates who wish to apply must look at PIMSE Recruitment 2017. Eligible candidates can apply offline before 15 days of publication. Interested & Eligible candidates can send their application along with all the necessary documents and testimonials to The General Secretary, Y & M Anjuman Khairul Islam, Baitul Aman Co-op Hsg Society Ltd. First Floor 2, Maulana Azad Road, Nagpada, Mumbai – 400608. Starting Date, Last Date to Apply Offline at Poona Institute of Management Sciences and Entrepreneurship which candidates should be remember as follows. Start Date to Apply Offline: 24-07-2017.